One of the world’s most prestigious weekly newspapers, The Economist, has released its first-ever college rankings and Texas A&M International University (TAMIU) has been ranked Ninth among the nation’s Top 20 Colleges and Universities and is the only Texas institution in the Top 20. The new college ranking looks at the value of the college or university, specifically those schools which really boost graduates’ salaries. Colleges are thus ranked based on alumni earnings above expectation. 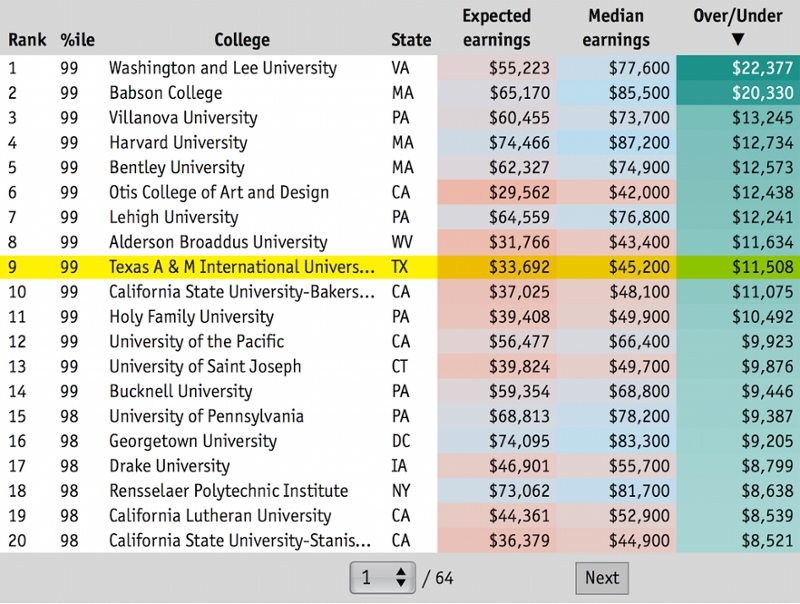 In the ranking, released Oct. 29, The Economist’s editors utilized the US Department of Education’s Scorecard to establish how much graduates earned and, to determine how much they might have earned, employed a multiple regression analysis to measure relationships between the variables. The Economist noted that projected earnings for bachelors degree graduates would be $33,692 based on Scorecard data, but actual median earnings for TAMIU graduates was $45,200, an $11,508 increase. TAMIU president Dr. Ray Keck concurred. “Having such an august publication esteemed for its outstanding reporting and economic analysis determine this about TAMIU is quite impressive. We know that our mission is delivered daily: lifting students up to their full potential…but this ranking offers an amazing affirmation that our mission is being realized in the marketplace. I know that potential students and their parents will find this insightful ranking worthy of their review,” Dr. Keck said. The list includes a broad spectrum of universities from Villanova University and Harvard University, ranked third and fourth respectively, to the University of Pennsylvania and Georgetown University, ranked 15th and 16th. Ranked No. 1 is Washington and Lee University in Virginia. Texas institutes listed include TAMIU at ninth, TAMU-Kingsville, 423; TAMU-Corpus Christi, 428; UTSA, 630; UT-Austin, 876 and Texas A&M University, 996. The Economist is owned by the Economist Group and is edited in offices in London. It began publication in 1843 and its audience is identified as primarily influential executives and policy-makers. For more, contact the TAMIU Office of Public Relations, Marketing and Information Services at 956.326.2180, email prmis@tamiu.edu, click on tamiu.edu or visit offices in the Sue and Radcliffe Killam Library, Suite 268. University information is also available on its social media sites on Facebook, Instagram, Twitter and YouTube.